Rome (Italy) – January 16, 2015 – After the successful debut of SeaDream Yacht Club’s Wine Voyages in 2014, eight vino-intensive voyages have been added to the 2015 season. Showcasing the most picturesque yachting ports of the Mediterranean on five to nine-day sailings, each dedicated Wine Voyage provides guests with heightened wine experiences including sit-down tastings featuring wineries from regions visited, a Wine Master Class Tasting led by an internationally recognized wine expert and one tasting held by a top winemaker. At an exclusive Winemaker’s Dinner taking place onboard, the chef will craft a special menu to match the wine of the winemaker joining for the evening. Together with SeaDream’s Wine Director Erica Landin, additional casual tastings are organized throughout sailings to highlight local producers or favorite wines from the SeaDream cellar. 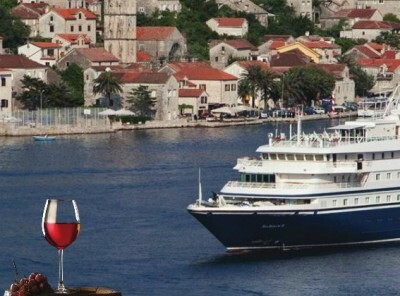 Sailing SeaDream I Aug. 8 to 15 from Civitavecchia (Rome) to Dubrovnik, guests will enjoy a memorable meals paired with the great wines of Chianti and other regions. Onboard this sailing is Wine Writer Anthony Rose of the British daily newspaper The Independent and Decanter Magazine, who will take guests on a tasting tour of the Italian greats including super-Tuscans as well as mini-tastings of wine from regions passing including Sicily, Puglia and Manduria. Special Wine Land Adventures include a visit to Cantina Benanti with owner, Antonio Benanti in Sicily and an intimate tour of Cantine Marisa Cuomo with Marisa Cuomo in Positano, Italy. Guests onboard the 112-guest mega-yacht for the Oct. 23 to Nov. 1 voyage sailing from Civitavecchia (Rome) to Malaga, Spain will be hosted by Guy de Rivoire, international export director of the Bollinger champagne house in Monaco, as he guides them through a tasting from rosé to vintage wines followed by a special Winemaker’s Dinner. On the same voyage, the head winemaker and/or one of the Martínez Bujanda family, owners of the Finca Valpiedra Winery, will present a special tasting menu onboard. Exclusive Wine Land Adventures on this voyage include a visit to the 1500-acre private estate of Château de Berne, Sanary-sur-Mer, the Cavas Recaredo winery in Sant Sardurní d’Anoia hosted by winery founder’s grandson, Ton Mata while docked in Barcelona, and the Simon Coll Chocolate Factory. SeaDream Yacht Club 2015 Wine Voyage fares begin at $3,599 per person based on double occupancy. For inquiries, contact a travel professional or SeaDream Yacht Club at 1-800-707-4911 or visit www.SeaDream.com. SeaDream Yacht Club has achieved the industry’s highest accolades for its two twin, casually elegant mega-yachts, SeaDream I and SeaDream II. With a maximum of only 112 guests and a 95-person award-winning crew, “It’s yachting, not cruising,” defines not only the size of the vessels, but the onboard lifestyle and anticipatory service. SeaDream Yacht Club provides a yachting experience visiting small harbors and ports around the world, many inaccessible by larger ships, on seven to 15-day voyages. An incredible array of services, activities, water toys, dining, wine, premium drinks and gratuities are available through SeaDream’s fully-inclusive fare. For more information, visit www.SeaDream.com or call 1-800-707-4911.